Shannon, Lyneya's Toys & Amazima Dolls Project. Who: Shannon of Lyneya's Toys is also the crafty mama behind the Amazima Dolls Project a "crafting for a cause" project, bringing crafters together to make 350 dolls for orphans in Uganda. Read more below about how you can get involved! 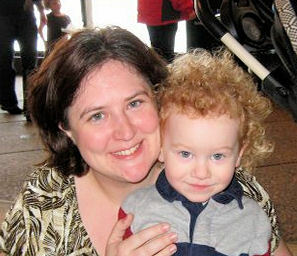 She is a mother of one crazy curly red-headed 2.5 year old boy who believes his mother can make anything. He isn't too far off, as she likes to try just about everything at least once. She is a non-practicing lawyer who wears pink lo-tops and has too many handmade toys in her house. My kind of gal. Besides the amazing project she has coordinated that we'll mostly focus on, she also makes fabulous dolls of natural materials to sell. I bought one of her "boy dolls" for my son last year and it is his absolute favorite. Her dolls have simple yet sweet features you can't help but fall in love with and I love that she focuses on dolls for boys. Can you tell us about the Amazima Dolls Project? 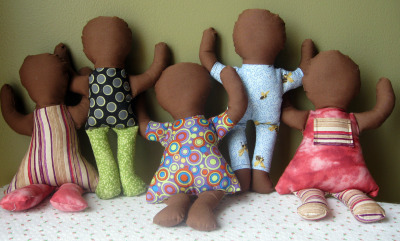 The project is to create a hand-made doll for each of the 300+ orphans in Uganda cared for by Amazima Ministries. We have coordinated transportation with a family traveling to Uganda before Christmas and hope to provide a very special Christmas for some very special children. What inspired you to start the Amazima Dolls Project? Katie, the 20 year old who IS Amazima, inspired me! I don't share her faith or strength, but I couldn't help but be moved by her work. She's a very young girl that's taken on a VERY large task. While in Uganda with a mission group a couple of years ago, she learned that there isn't public school in that area, so an education is beyond the reach of many of the families there. And the children she was working with were so hungry they were literally eating their pencils just to have something in their little bellies. At 18 years old, she created her own non-profit organization to feed, cloth, and educate as many orphans as she could. Two years later, she's providing 2 meals a day, uniforms, school supplies, medical care, tuition and love to over three hundred orphans. They're adding more kids to the program every day! Katie has even adopted 13 girls to raise on her own. I saw a photo of her girls on their front porch. One of the little ones had a baby doll - you know the one, plastic head, hands and feet, and cloth body. It reminded me that kids are just kids no matter where they live. Katie tries to love all of the kids in her care, but she can't be there all the time and I thought that a special doll of their own would fill some of the void for those kids that have been through so much. I spoke with someone in the group about doing a few dolls for the group (thinking for kids in need of some special comfort)...they were very gracious, but explained Katie's policy - what one child gets, they all get. They couldn't accept less than 350 dolls. I decided to rally the troops!! And I haven't been disappointed so far! Over 200 dolls have been pledged in the first week! I would love to do way over 350. And if we get so many dolls that Amazima says "STOP!!" there are many other similar organizations operating in the region. I can promise that every single doll sent in will be given to an orphan in Uganda. The deadline to get them in the mail to me is October 1, 2009...so we've got all summer to use up our stashes of fabric and yarn and craft our little fingers off for a wonderful cause! I don't think I've ever been this excited about a project! 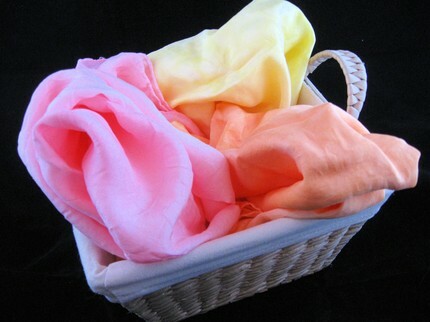 How can other crafters get involved with the project? Sew, knit, crochet, spread the word!!! Visit the Amazima Dolls Project website for detailed info & for the volunteer form. Free patterns are provided. I designed the cloth doll pattern based on the doll pattern here. A knit pattern was donated to the project by a lovely etsy seller, and I found a couple of crochet options as well - so we're equal opportunity!! Even if you can't make a doll yourself, please tell someone you know that can sew, knit or crochet. Blog about it. Every single doll will go directly to an orphan in Uganda and will be cherished. If you can help get even one extra doll made, you have helped more than you'll ever know. How long have you been selling dolls on Etsy and what lead up to it? I started selling on Etsy last fall. I started by making a few dolls for my son and friends, and an obnoxious amount of felt food! I enjoyed it a lot and other people seemed to like them, so I decided to see if I couldn't "swap" my sewing skills for some of the bigger toys I didn't have the tools to make myself. 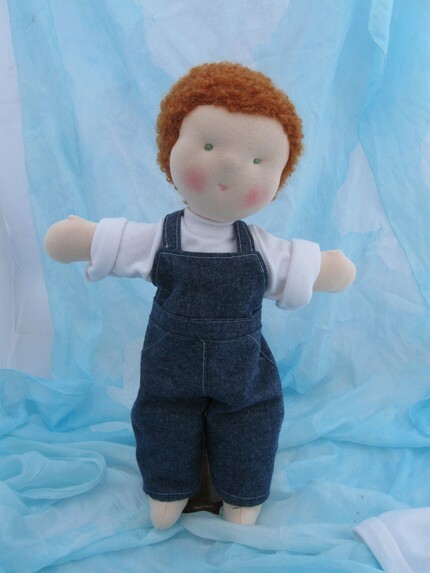 I really wanted to focus on making contemporary looking boy dolls at a price that was affordable for most people. I still do the odd tom-boy doll now and then, but the majority of items in my little shop will always be gender neutral or aimed at boys! What was your goal when you started selling your dolls on Etsy? My goal was just to make a little extra money to buy something big for my little boy. It was a wonderful success. And it's really been a wonderful experience! Etsy and the crafting community are so welcoming and supportive. And every single time someone makes a purchase I still get a happy flutter! I especially love sending dolls to little boys! Any future business plans or "crafting for a cause" plans? I don't know for sure if I'll keep my business up in 2010. It depends on how the new laws play out. But it might be hard to give it up completely--I really enjoy it! It is difficult though because I already work full time and have a busy little guy at home. Sleep is a rare commodity. So I might just cut back a bit and focus on my little man for a while. And, I have so many cool ideas of new projects I want to try! I don't think I'll be able to ever give up etsy completely. I just love it!! As far as crafting for a cause plans...I don't know! This project just sort of jumped into existence. I've been overwhelmed with the generous response of the crafters. And thank goodness for the internet!!! I could never pull this off on my own. This is my first experience really stepping outside of my comfort zone and doing something bigger than myself. I don't think it will be the last. What is your favorite part of the creative process from idea to completion? I'm a dabbler...so I'm always trying new things. But no matter what the type of project I still get a kick out of the fact that a pile of raw materials turns into SOMETHING. 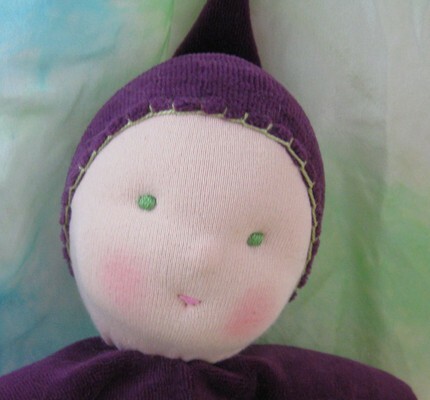 Fabric and wool can turn into a doll. Wood and paint into a whole menagerie for my son. Pipe-cleaners and string into dollhouse people! Yarn into, well, anything! I just don't have enough time in the day to try everything, so at any given time I've usually got half a dozen projects going. What crafty skill have you always wanted to learn but have never gotten around to? Pottery!!! I took a community ed class once with a couple of friends and I loved it, but never seemed to get enough time at the wheel to get very good. And glass blowing would be really neat to try once! Thanks Shannon! Visit her Etsy shop at Lyneya's Toys and the Amazima Dolls Project and support a fellow crafty mama or get crafty for a cause!